in the surrounding of Milan, in the park of Vialle Reale lies the Autodromo di Monza. One of the last few fast and old fashioned European GP circuits. The track was constructed in 1922 to celebrate the 25th anniversary of the founding of the Milan Automobile Club. The S.I.A.S (Società Incremento Automobilismo e Sport) was set up to organise the construction that was funded entirely with private capital. The track was designed by the architect Alfredo Rosselli with various goals in mind. Several possible locations were considered for the autodrome, the most convincing of which were in the "moorland" area of Gallarate, where Malpensa international airport now lies, and the Cagnola district which at that time was on the outskirts of Milan. The draft projects for these two solutions called for a peripheral ring circuit with possible complementary courses inside it. But the final decision fell on the Villa Reale park in Monza which, at that time belonged to the Italian Veterans' Institute. The first stone was laid by Vincenzo Lancia and Felice Nazzaro at the end of February, 1922, but only a few days later the first ecological concern began to show up with the intervention of the under-secretary for Public Education, who ordered suspension of work for reasons of "artistic and monumental value and landscape conservation". As the intricate controversy developed the argument for the absolute necessity of the autodrome prevailed, even though with smaller size than originally planned, and at the end of April official approval was received. Constructors wanted somewhere to test vehicles at top speeds, and so needed a good straight. It also needed to test the manoeuvrability and resilience of the machines under extreme conditions. 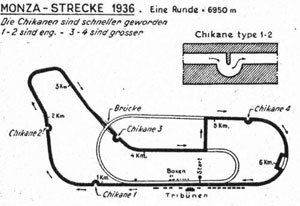 In terms of creating a good racing track, there needed to be a balance of high speed sections and more demanding corners, all of which needed to be easy to place spectators round. Opened in 1922, it was only the third purpose-built motor racing circuit to be constructed after Brooklands and Indianapolis. the track was completed in August. The grand stands opened to the public in September. The track was 10 km in length and was built on an area of 340 hectares.